Like Myers & Briggs, another mother and daughter team, Anne Dranitsaris, Ph.D. and Heather Dranitsaris-Hilliard, have created the Striving Styles to show people the true mechanics of their minds, so they can direct how it functions and how they feel -- as Jung intended with his work! The SSPS is a way of understanding the more dynamic and interpersonal aspects of an individual’s personality and how their needs and emotions cause shifts in behavior. 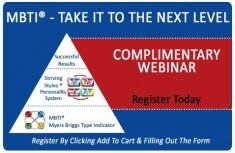 It incorporates the neuroscience of personality and brain development, it allows us to leverage what we have learned through the MBTI personality test. As a result, we can now enhance our ability to understand and help others achieve their potential. Now that we have embraced the developments in brain specialization and dominance and incorporated them into the SSPS, people are now able to gain more insight into how their brains work and take charge of their own personal growth and development. Finally, everyone dedicated to using Psychological Type theory, the MBTI and other related personality tests can integrate the advantages of brain science and neuroplasticity. With the SSPS, personality type becomes something that everyone must know about to achieve their potential in life. 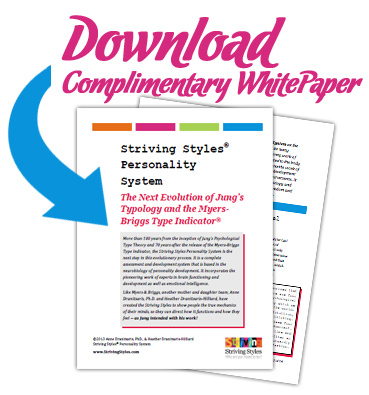 Learn more about the SSPS and how it evolved from Psychological Type theory and the Myers-Briggs Type Indicator. 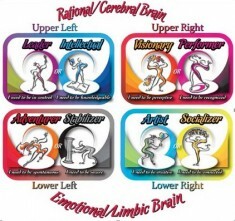 Each of the Styles represent one of Jung's 8 function & attitude combinations (e.g., the Leader Striving Style is Extroverted Thinking) and play a different role in our personality based on where they are located in the brain.